Join your family in saving the day with this Mr Incredible costume. 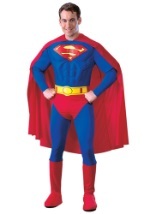 You can bring back the golden age of superheroes in this full muscled body suit. The polyester uniform has a padded torso, arms and legs and the Incredibles logo printed in the front. A foam black mask completes this superhero costume. Be sure to also check out our Mrs Incredible, Dash and Violet costumes too!